New argument against Palestinian state: There's no P in Arabic. 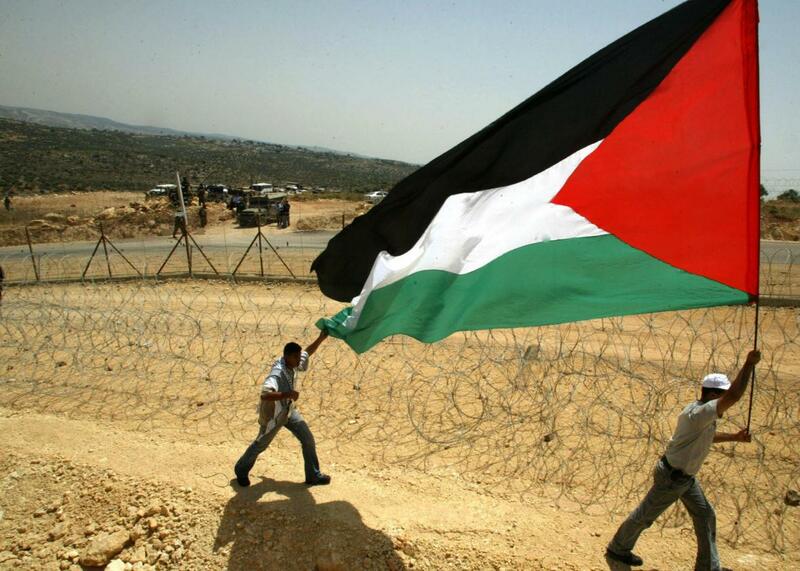 A man carries the Palestinian flag next to the path of the Israeli separation barrier in the West Bank village of Bilin on May 26, 2006. Place names are politically fraught in the Israeli-Palestinian conflict—see some Israeli leaders’ insistence on referring to the West Bank as “Judea and Samaria” for example—but Israeli lawmaker Anat Berko’s new argument against Palestinian statehood is still pretty audacious. On Wednesday, the minister of the Knesset from the ruling Likud party suggested that there’s no such thing as a Palestinian people because Arabic doesn’t have a letter P.
“I want to go back to history, what is our place here, about Jerusalem, about Palestine, when like we said, Arabic doesn’t even have ‘P,’ so this loan-word also merits scrutiny,” she said, according to Haaretz. The remark came during a Knesset debate over a contentious proposal from opposition leader Isaac Herzog for Israel to unilaterally separate from the Palestinians in the absence of a two-state solution. Berko’s argument got an immediate response. “What? Did everyone hear this? Are you an idiot?” replied an MK from the opposition Meretz party. Arab lawmakers walked out in protest, reportedly muttering “P-P-P” under their breath. Berko is correct that Arabic doesn’t have a P sound, but it does have an F sound, and the word for Palestine in Arabic is Falastin, also how most Hebrew-speakers pronounce it. The New York Times notes that the statement has been widely mocked in the Hebrew and Arabic media, with some joking that by her logic, there’s no pizza in America because English doesn’t have the Hebrew letter Tzadik, to make a tza sound. Jews might also be in trouble since there’s no J in Hebrew. It might also blow Berko’s mind to learn that German, Egyptian, Chinese, and Japanese people, among many others, don’t actually refer to themselves by those names.